As mentioned before, I finally finished working on Casey and Jack’s quilt – eight months total in the making! – and I’ve moved on to the next projects in the queue. In addition to the crocheted items I’m working on (most of them coming along nicely…one that I’ve been sort of avoiding out of terror but should really start soon), I’ve been working on some new quilt pieces. There are two quilts on my “to be made” list, to be specific. One has a much shorter needs-to-be-done timeline than the other, as my sister is expecting her newest addition in early February. Usually I’ll have a definite idea for what patchwork pattern I’ll be using, or at least have centered on a particular fabric, but I’m a little stumped on this one. 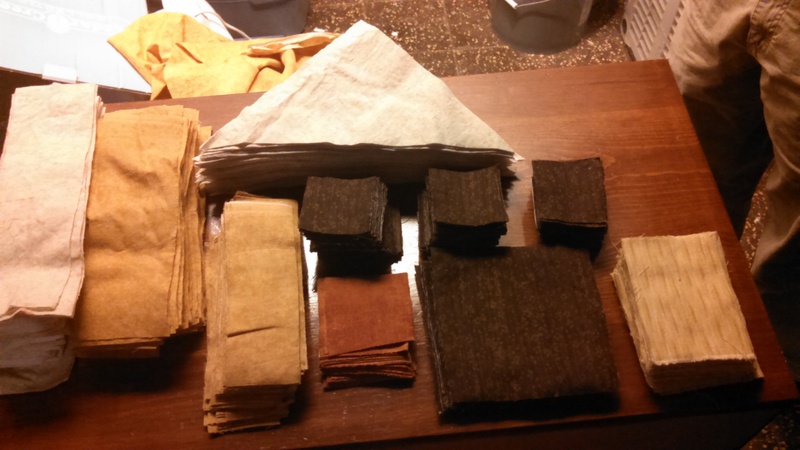 I went through and pulled a couple of yards of assorted fabrics from my stash – some patterns, some solids – and have been trying to figure out what goes with what. No ideas as of yet, though. The other quilt I’m working on does not have a similar problem. I know exactly what I’m doing for that one, and have for some time. It’s taken a while to get all of the fabrics I needed (I swapped out some that I had originally picked for some others I happened to find recently), but I finally tracked down all the fabric, and cut out the pieces. I’m doing paper pieced foundations for this one, as the patterns are a little more intricate than what I normally do, and I didn’t want to painstakingly match up all of the corners and edges. I’ve done four squares so far, and set them down to be photographed, to get a better idea of how they’ll look all together…only to have Raven decide he had to sit on them right then! I’ve since moved them – several times – and, each time I do, he finds them and sits on them. 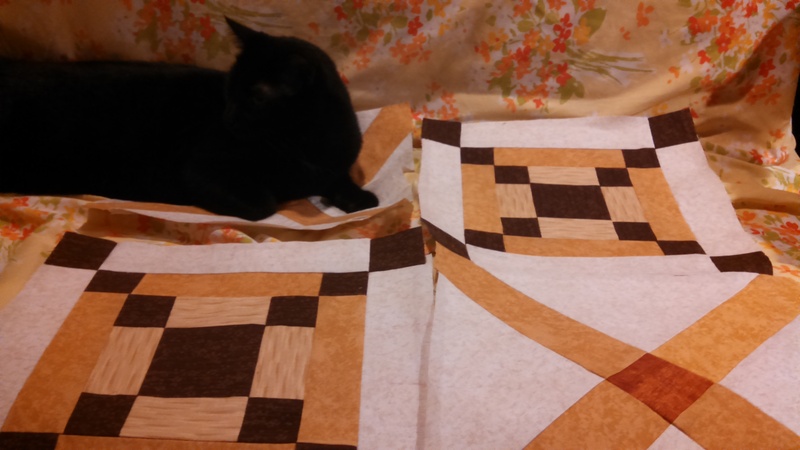 My cats really seem to like every aspect of quilting.